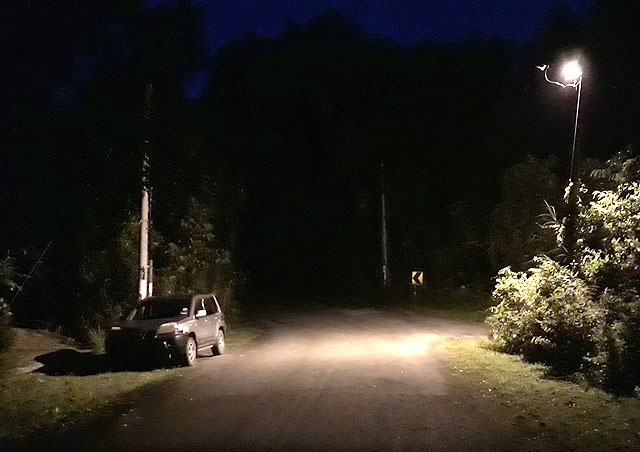 We arrived at the first location for the day in total darkness except for a single street lamp to illuminate the way. The Milky Way scattered all over the night sky like tiny diamonds was as impressive as always and together with the small crescent of a moon, provided the prelude to a memorable nocturnal excursion that was to come. My Singaporean guests wanted to experience owling here in northern Peninsular Malaysia and there is no other place that can better the forest surrounding Pedu Lake at the present time. In no time, we were surrounded by eerie and unearthly sounds that penetrated the cloak of darkness concealing the forest. 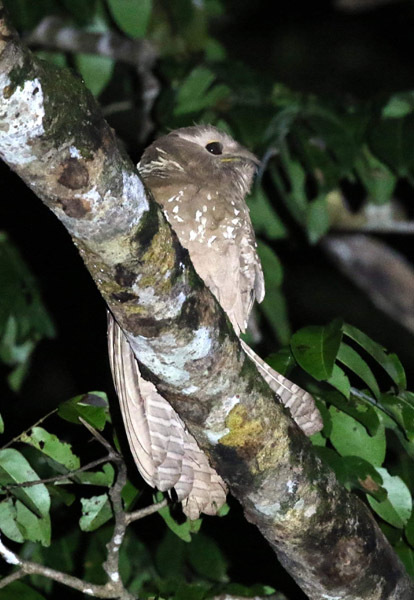 Instead of fear, there was excitement in the group as they were the calls of a family of intriguing night birds known as frogmouths. All three species that occur here in Peninsular Malaysia were vocalizing in this one area. I had to make a choice on which one to seek out first. And the choice was simple. The Large Frogmouth is just too spectacular for the smaller Gould’s and Blyth’s Frogmouth to compete for attention. With a little patience and luck, we managed to obtain an incredible view of the Large Frogmouth and all the effort leading to this moment was worth the while. Even the fact that only my guest had a photo to show at the end of it all does not make the encounter any less significant. I was happy for him - honest! After daybreak, we walked along the access road hoping to observe more of the alluring bird life here. Although the forest here have been logged, it is still quite pristine. Huge forest trees reach for the heavens above and lush vegetation covers the under storey making it an ideal and rich ecosystem. 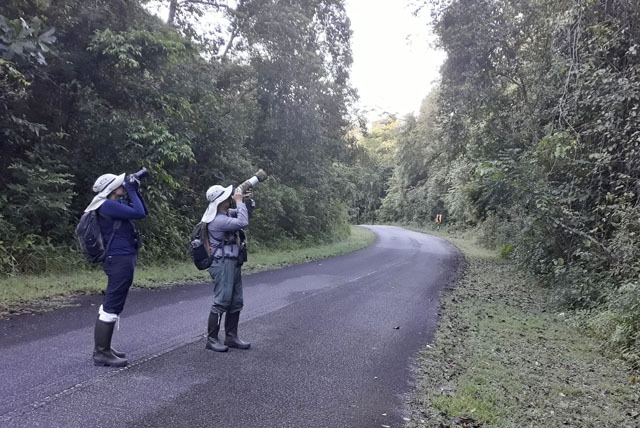 Pedu is probably the best and most extensive forest birding site in this part of the peninsular and I hope it stays that way for a long time to come. 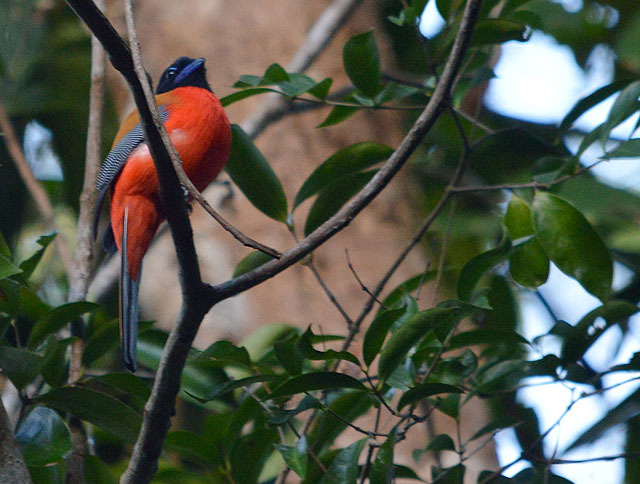 A flash of red and black among the green foliage could well be a trogon on the hunt and upon further scrutiny, it turned out to be a male Scarlet-rumped Trogon. 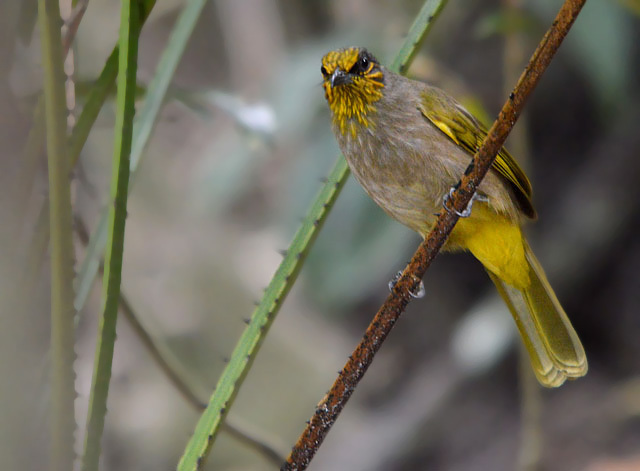 Although this is the most frequently encountered species here, it was still exciting to see a male bird – especially when he alighted momentarily on an exposed perch. The presence of a second bird in the vicinity did not go unnoticed and it was the female bird. However, she was rather shy today and the male was the one only I could photograph. This is not often the case. Murphy will usually make sure that the drabber ones perform much better than the attractive ones. Unfortunately, the diurnal birds could not maintain the momentum. 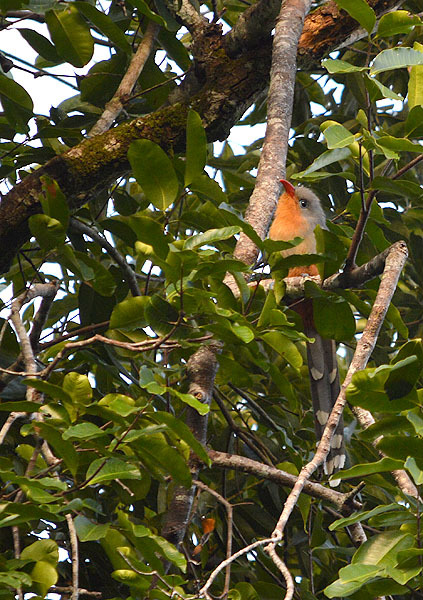 Things started to sizzle down after we came across a foraging Red-billed Malkoha. Scurrying along the forest canopy, this beautiful cuckoo provided very little opportunities to capture good images. 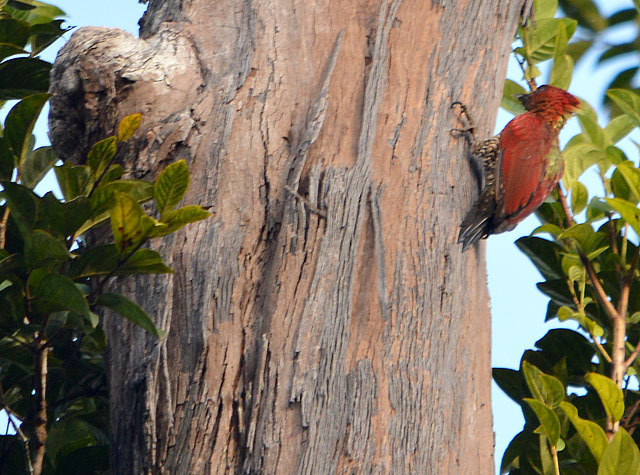 A distant Banded Woodpecker hunting on a tall dead tree was more of a visual treat than photographic. The forest was by no means void of birds but most proved to be difficult to be photographed today. 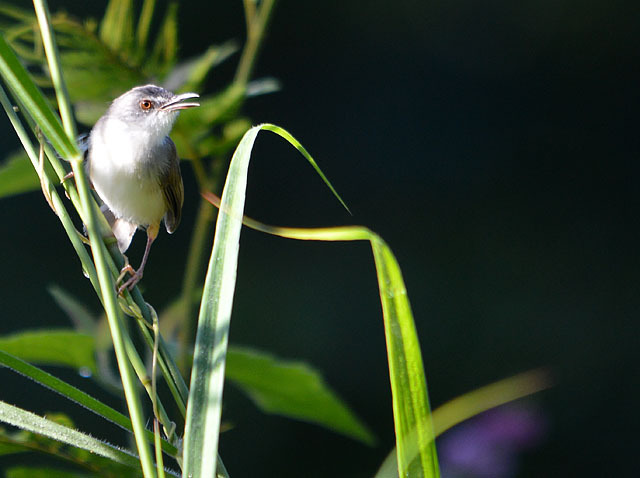 Half a dozen babbler species teased us with fleeting glimpses from the forest undergrowth. An area of long grass at the edge of the forest offered some reprieve. A pair of foraging Rufescent Prinias came into view and despite the harsh lighting, the warblers were a delight to observe. The mangroves of Sungai Batu soon beckoned and we made our way south to this expansive coastal habitat. 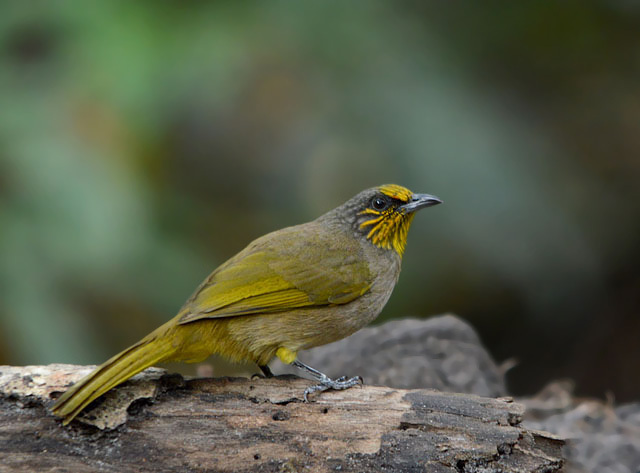 The Mangrove Pitta was no where to be seen today but in its absent, a pair of Stripe-throated Bulbuls provided the highlight of the visit to this locality. This is my first record of the species here and it is certainly a welcomed addition to my checklist. It may not be an uncommon bird but I do not have many images of it. The bright yellow streaks certainly stand out from the rest of its plumage and this is probably one of my best encounters to date. 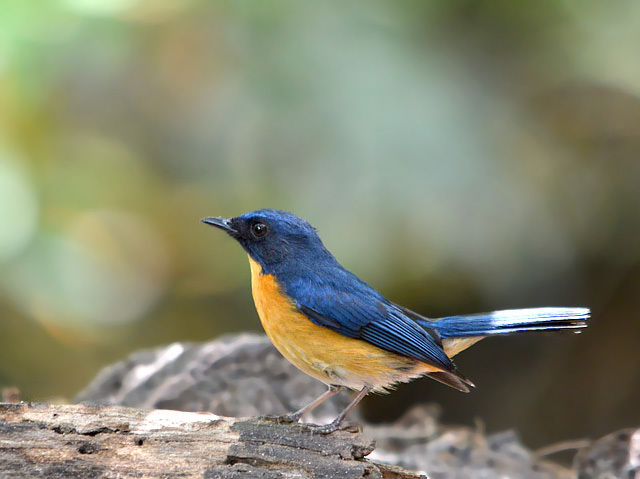 The Mangrove Blue Flycatcher was probably the most vibrant species present today. The male was looking exceptionally handsome today as it went about its routine. 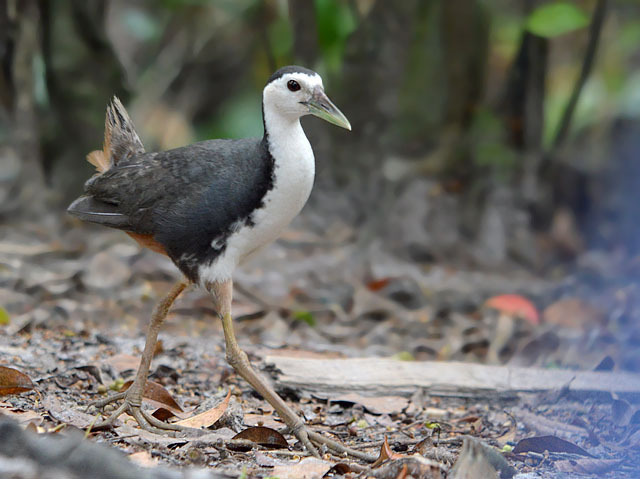 The lumbering gait was unmistakeable even from a distance as the White-breasted Waterhen strolled into today’s excursion. It was a young bird judging from the slightly dull colouration. And no doubt, it will bloom into a striking adult one day soon. 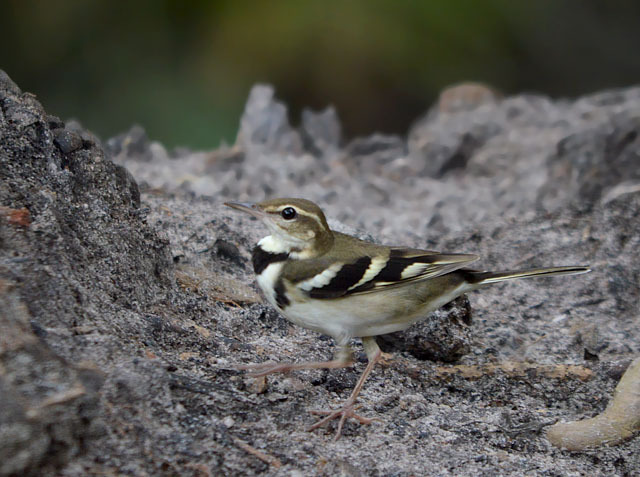 It was good to see a number of Forest Wagtails present in the vicinity today. However, the birds were exceptionally restless today. On a normal day, it is sometimes difficult to obtain their images without some part of their body blurred by movement. My photographic skills and patience were certainly put to the test today. 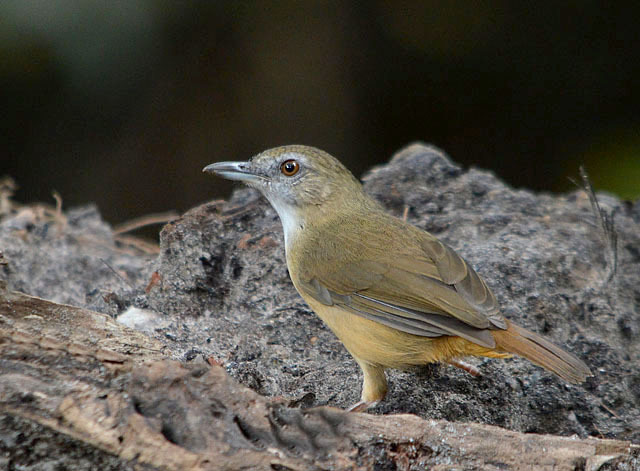 The resident Abbott’s Babblers were their usual laid back selves as they enjoy life here in this swampy landscape and they were the last species to be observed before we ended the visit here. 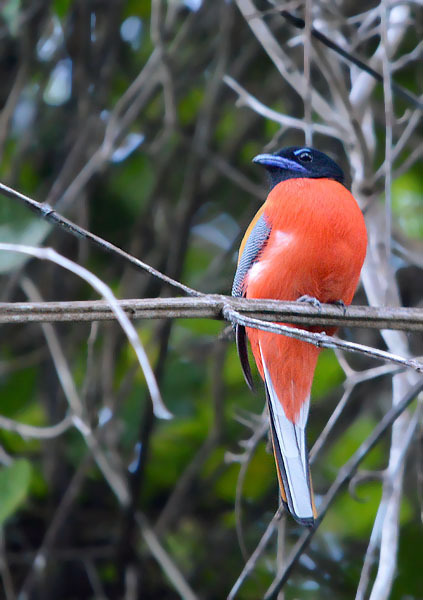 Our final destination for this 2-day birding excursion was the swamp forest of Air Hitam Dalam. The resplendent Violet Cuckoo proved to be elusive again for me. 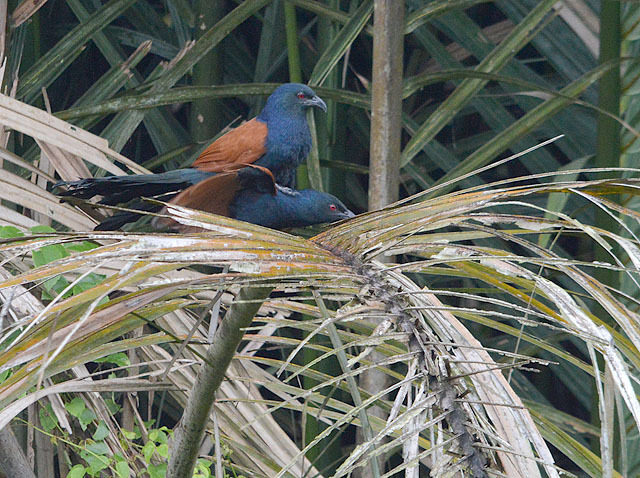 Another cuckoo species provided some compensation when we stumbled onto them in a compromising position. Greater Coucals are conspicuous residents here due to their vocal nature and if all goes well, these two will bring in the next generation to expand the population. 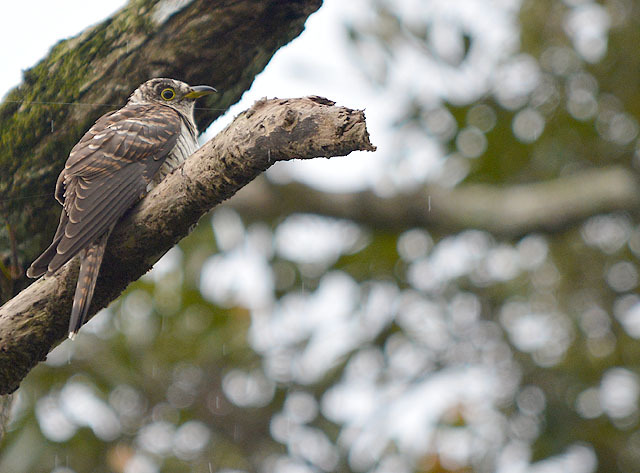 There have been sight records of several cuckoo species at this birding location recently and it came as no surprise when we saw a juvenile Indian Cuckoo on a lofty perch. Lacking the colouration of the adult bird, this youngster was given a second look just in case it turned out to be something else. The very first image taken by my guests was of a flock of Asian Openbills and it only seemed fitting to end the 2-day birding excursion with a photo of another flock of these charismatic water birds. 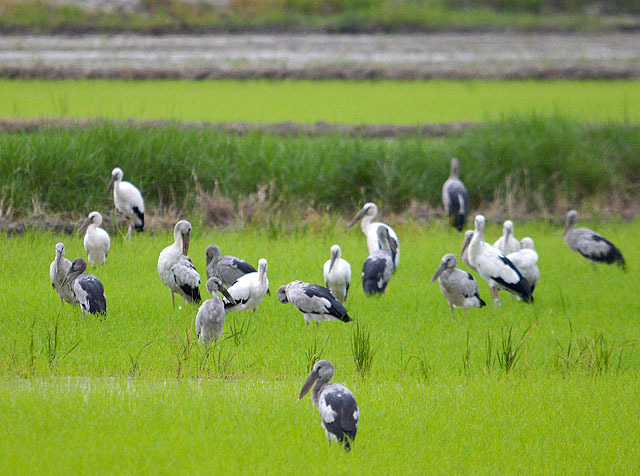 The diffused lighting from the gloomy sky brought out the storks’ true appeal as they stood in a sea of green. But as we uncoiled for the day, my thoughts went back to the predawn experience that had us surrounded by frogmouths. Now, that was a memory worth revisiting.